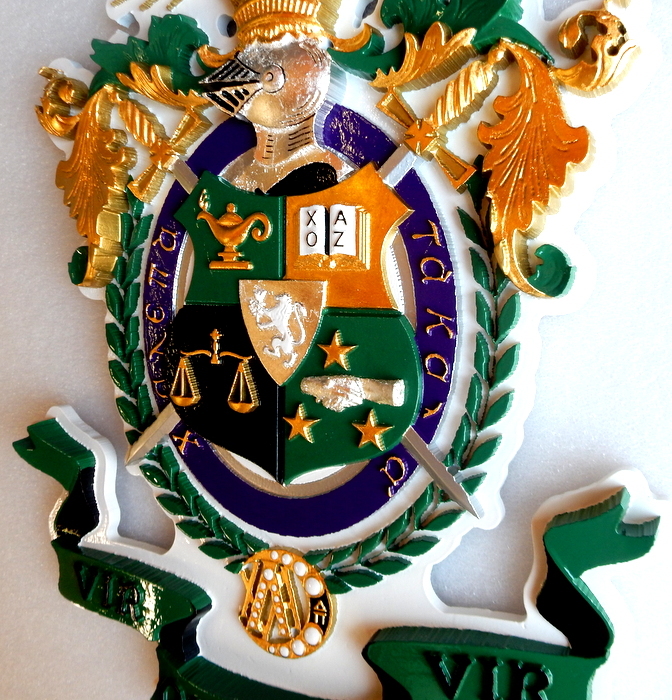 Above is a photo of a gold-leaf and silver-leaf gilded 3D carved High-Density-Urethane (HDU) indoor wall plaque of the coat-of-arms for the Lambda Chi alpha college fraternity at Cornell University. After very complex carving, its surface is finished with gold and silver leaf and 1-Shot colored sign enamels This wall plaque is 36 inches in high, but it and similar signs can be made in any size from 16 inches to 60 inches in height. To see other photo galleries, please click on one of the numbered gray boxes in the lower left margin of this page to see other photo Galleries. Other Fraternity plaques are shown in Gallery 34. To see prices or get Estimate and Order forms , click on gray boxes in upper left margin. Click on dark gray tabs on the header to see Home and other informational pages.